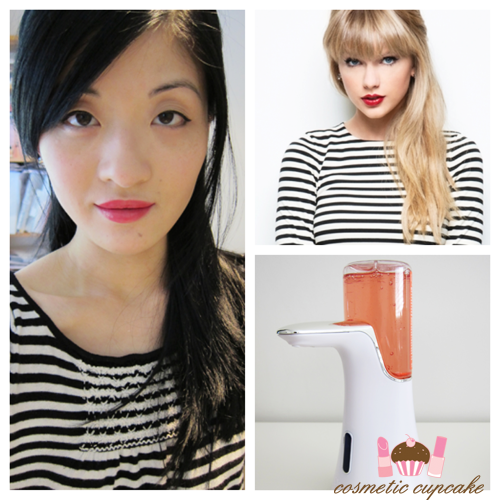 Cosmetic Cupcake: Taylor Swift "Red" inspired FOTD and a giveaway! When I was in Hong Kong recently, there were promo posters everywhere for Taylor Swift’s upcoming Red album. I’ve always been a fan of her makeup looks – her skin is always glowing and she looks so polished and fresh faced. 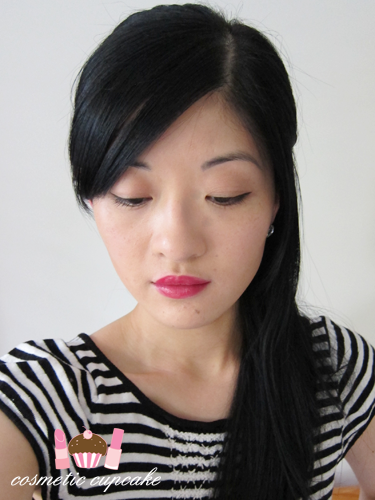 In this particular pic she’s rocking a cherry red lip, winged liner and paired it with a cute black and white retro top and I loved the look so much I had to recreate it as soon as I got home! She’s been sporting a similar look while out and about on her promo tour for the new album this month and I love seeing the pics as it gives me great beauty inspiration. Her flawless skin and red pout look fantastic and is a look that would suit everyone. You too can get flawless red carpet ready skin at home with the Clearasil PerfectaWash which I’ve introduced to you previously. Celebrities may have their makeup artists to help them look picture perfect but makeup can only hide so much. It’s important to start off with good basics like cleansing and moisturising twice daily and making sure to remove all traces of makeup at the end of the night to help achieve a healthy and glowing complexion. While trialling the Clearasil PerfectaWash I must say my skin has been behaving itself and I haven’t experienced as many breakouts as usual. I’ve been rocking the natural look as much as I can so I started off with a sheer base by using Make Up For Ever Face and Body foundation in 20. 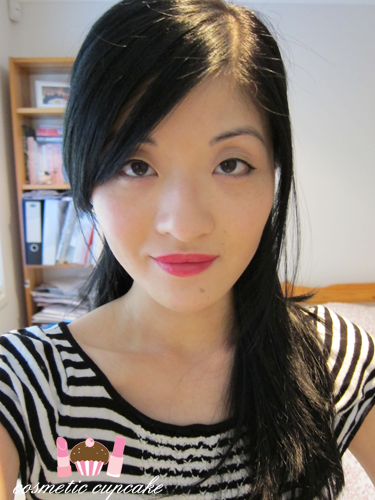 I skipped powder and just used MAC Select Moisture Cover concealer in NW20 to conceal my dark circles (lack of sleep!). Taylor only has a hint of colour on her cheeks as the lip colour is so strong so I contoured my cheeks using Estee Lauder Bronze Goddess and skipped the blush. I applied a wash of Illamasqua Cream Pigment in Hollow and winged out my Face of Australia liquid liner for a small cat eye. On the lower lash line I smudged Make Up For Ever Aqua Eyes liner in black on the outer third of my eye and I finished with Dolly Wink Long mascara. For my bright red lips I lined my lips using Shisheido The Makeup Lip Liner & Pencil in Red Rouge and applied Tom Ford Lip Color in Cherry Lush! Leave me a comment with your answer below for your chance to win! Easy! The competition is open to Australian residents only and ends at 5pm AEST on November 22nd 2012. The winner will be chosen by Nuffnang. See Terms & Conditions here. The winner of my last Clearasil PerfectaWash giveaway was Crepe and her prize is on it's way to her now! That lipstick looks amazing on you :) Really brightens up the entire face! I haven't tried the new perfecta wash or its dispenser because they're too expensive for me to buy without testing first. They need trial things of these, like little stations where you can test it at a basin! I haven't tried the Clearasil Perfect-a-wash yet but I would like to! This looks great on you, I agree that starting with a clear skin base is very important, especially for looks like this! I think red lips really suit you. I actually haven't tried the Clearasil Perfectawash yet , I sadly haven't been around to picking it up. Though my face is starting to break out lots around my nose so I should really get it soon! I love the look, so pretty and classy. I am loving the whole look. 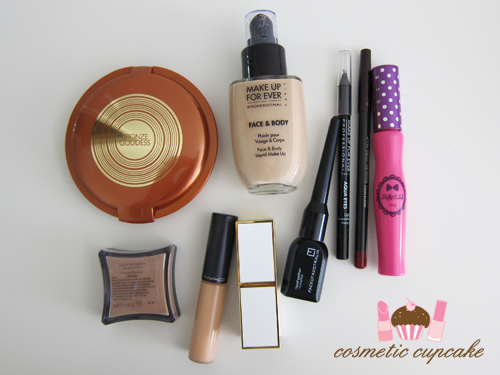 The make up look so light and fresh! i lovvveee love loveee estee lauder bronze goddess!